are very easy and very pretty ornaments that you could make. Poinsettias are a festive and fun symbol of the holiday season, so they are perfect for ornaments. which would include most of these items. Then you could follow the directions provided in the kits. On your red felt, lightly sketch the shape of a poinsettia. Make this one with six leaves and fairly small. After you cut out your first poinsettia, use it to trace a slightly larger one using your red felt as well. Repeat this step twice using each shade of green felt once. You should have four layers for your poinsettia ornament. There should be two green for the leaves and two red for the flower. Stack them from largest to smallest with the green leaves on the bottom and the red flower on top. Use your hot glue gun to glue the layer together, but also hot glue your ornament hook in middle of the layers. Take your glitter spray and spray the ornaments either outside or on top of newspaper so that you don’t get glitter on nearby objects and surfaces. 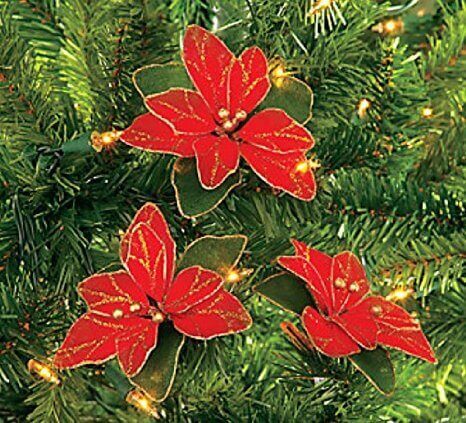 Lastly, hot glue 2-3 jingle bells in the center of your poinsettia ornaments for the finishing touch.